11 Homemade Cleaning Recipes! Includes Homemade Dishwasher Detergent! T is back today with some more great recipes – today instead of cooking, she’s cleaning! 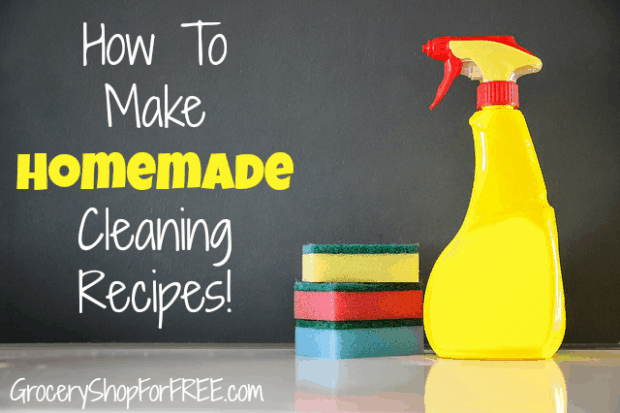 Check out these great Homemade Cleaning Recipes, she’s sharing with us! I had a totally different tip planned for today but the best made plans are typically ruined. My plan was ruined by a teen throwing my car keys into a pool that resembles Shrek’s swamp. I guess I will have to adjust my day and just give you some crazy DIY Homemade Cleaning Recipes for useful household cleaning. These Cleaning Recipes can be completed using things you have in your house, including Homemade Dishwasher Detergent! Basically, you use equal parts Borax and Washing Soda. If you are making a smaller container of detergent, then just fill whatever container you use with hot boiling water. The amount of Borax and Washing Soda can be tweaked as long as you keep them equal. In this video I used twice the amount of ingredients because I made a 10 gallon bucket. To keep drains clean and clear, prevention is the best solution. Pour 1/2 cup of baking soda down the drain followed by 1/2 cup of vinegar and cover the drain. This solution will foam and fizzle so don’t worry about that. Let it sit for 30 minutes and then run cool water down the drain. Use 1/4 cup when washing clothing. Soak a towel or piece of fabric in the fabric softener and toss it in the dryer for homemade dryer sheets. *Rub this mixture over the inner glass of the oven door. Let it sit for 30 minutes and voila! Use 1/4 tablespoon in dishwasher. Vinegar should be used as a rinse aide. *Heat in microwave for 3 minutes and then use the solution to clean the microwave. Rub it on and wipe it away! These are few great Homemade Cleaning Recipes you make yourself using things that might be in your house already! Please feel free to share more cleaning tips and tricks!